Shako - the headgear known as a "stove-pipe" shako. Made of wool felt and lacquered to make it waterproof was approximately 7 inches high with a black leather peak. The front had a stamped brass plate, 6 inches by 4 inches. Above the plate was a black rosette with a regimental button in front of the white worsted plume. The colour of the plume indicated the company of the battalion for which the soldier belonged. In the case of the Grenadiers, the colour is white. Neck Stock - a solid piece of leather worn around the neck. From the fashion of the day, but for military use designed to be uncomfortable and keep the soldiers head up and keep him awake. Shirt - of coarse linen, white. The soldier was provided with 2 and expected to keep them clean. The collar was buttoned at the throat with one button and the shirt was not to turn over the neck stock and must be entirely hid from view. 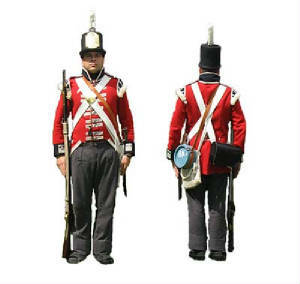 Regimental Coat - the British red coat. The distinctive red coat of the British soldier , the Royal colour of British nobility, was used for centuries. Regiments were differentiated from others by the differing colours on cuffs and collars, lace around buttonholes, cuffs and lapels and the buttons themselves. The Royal Scots facing colour (collars and cuffs) is royal blue for nobility. The Royal Scots were one of a few Regiments that were of Royal distinction. Trousers - Drop front trousers made of grey wool. Gaiters - calf length wool material buttoned along the side over the boots and under the trousers. These helped keep water and stones from entering the soldiers boots and was a throw back to earlier taller gaiters worn in the 18th century. Footwear - Leather low buckle shoes of no right or left variance. The soldier was to, daily, alternate the shoe to each foot to give better wear. Crossbelts - The white leather belts crossing the chest. These were to be kept white at all times. They supported the soldiers cartridge belt and bayonet. 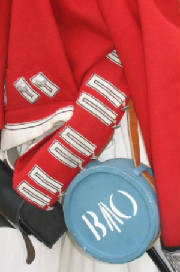 Upon the belts in the centre was a regimental belt plate specific to the regiment for which the soldier served. Cartridge box - The black leather pouch carried on the belt to the soldiers right and behind above his hip. This carried the soldiers ammunition supply of gun powder and ball charges. Bayonet - the bayonet hanging from the belt to the left was seventeen inches long with a triangular blade. A wound caused by a bayonet would be very difficult to treat. Haversack - the natural (light brown) linen bag which hung on his left side. Issued by the Board of Ordinance and was used to keep rations in on the march. Canteen - this blue item slung around to the back kept the soldier's supply of drinking water. Made of wood and lined with beeswax and stamped with the British Ordinance symbol. Musket - The British weapon of choice was the 'Brown Bess' flintlock musket. The longest served and most produced weapon for the British military. The weapon used a piece of flint which, when struck against the metal frizen, caused sparks to ignite the powder charge in the pan. The charge firing in the pan would ignite the powder in the barrel through a touch hole and expel the lead ball toward the enemy. Being somewhat inaccurate, massed volley was used to engage an enemy.